Bookworm Book Shop is hosting its annual book fair in the Grade 3 Hallway from Sunday, December 10 to Wednesday, December 13, 8:00 a.m. - 4:00 p.m. Elementary students will visit the fair with their classroom teachers. Families are welcome to browse throughout the day. 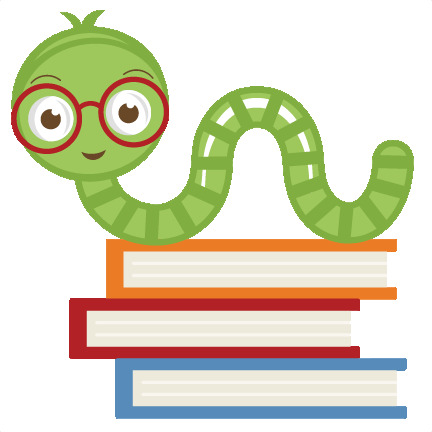 The ASD Libraries benefit by receiving 10 percent of total purchases in store credit at Bookworm Book Shop. Last year, the libraries acquired 250 new books, thanks to the sales from the book fair. Enjoy some Christmas book shopping, and give back to your libraries! We are excited to welcome back our community of learners to the ASD Libraries. And, we offer a warm invitation to all of our new families to stop by and learn what the libraries have to offer! Our libraries are community hubs for students, parents, faculty and staff. We encourage you to take advantage our our vast resources and variety of spaces. Our ES Library is open from 7:45 am - 4:15 pm and our MS/HS Library is open from 7:45 am - 4:45 pm. Please visit our ES Library and MS/HS Library websites to learn more. Over the last three years the K-12 Library Team has been dreaming big. As we reimagine our spaces, we reimagine learning. Our goal is to ultimately transform our library spaces to create relevant, engaging centers for collaboration, communication and innovation with future learning in mind. Our libraries aim to be enticing, impactful, inspiring, and visionary. Our spaces and services will embody our core values and enhance learning experiences for our entire community. Create distinctive ASD Libraries identity and signage. Develop collaborative, flexible study rooms and classrooms. Create multi-purpose learning areas using dynamic, flexible and varied seating. Enhance and showcase print collection with versatile, mobile shelving. As a result of the giving of many donors and event proceeds, we were able to achieve these targets over a three year period. We have designed a distinctive visual K-12 Library identity creating consistent, recognizable library experience for our community. We have designed a distinctive visual K-12 Library identity creating consistent, recognizable library experience for our community. Our new library seating supports student learning by creating areas for collaboration as well as individual work. Furniture sizes, colors, and styles are comfortable, inviting, and functional. Our study rooms and classrooms offer students and teachers flexibility. Learning spaces can be easily adjusted with foldable tables on wheels and stacking, lightweight chairs. White boards and/or flat screens for projection are available in all rooms. With our new shelving system, we can showcase a relevant and appealing print collection that enables student discovery and logical organization. Many shelving units are on wheels allowing for flexible space design. Shelves are used to create interesting seating areas for collaboration and independent study. We have created open, student-friendly information points and self-check stations. The footprint of the circulation desk has been reduced and increased flexibility. We look forward to more developments in the next few months as we receive more seating for our libraries and open the new Professional Learning Library. Stay tuned! We welcome your feedback as we seek to continually improve and reimagine the possibilities for ASD Libraries. All students in K1, K2 and Grade 1 have now received their new ASD Libraries book bag. Each bag is labelled with the student's name and class. Please ensure that students bring the bags to their library class on the library class day in the rotation. All other students and parents may purchase a bag for AED 30. Please visit the ES Library to get yours today! Build up your reading strength this summer! Create your own unique challenge by reading a variety of books. Choose from the attached list or design your own challenge entirely! Turn your record into the library by Thursday, September 7. Receive a certificate from Mr. Advento and special recognition at the first ES Assembly. Click on the links below to print out your record sheet or to help you make your own creative sheet. We have provided some choices to help you build your challenge. Feel free to make up your own as well. How you construct your summer reading plan is entirely up to you! Parents are invited to join us for a special Talk Tuesday about summer reading on May 30, 2017 from 8:45 - 9:45 am in the Elementary Library, Ground Floor. Join Natasha Pollock and Mary Kelly Bello, ASD Librarians, and learn about ASD's e-resources that can be accessed from anywhere over the summer. Help support the reader in your family by participating in the Build-Your-Own Summer Reading Challenge. Also, get a head start and discover who the visiting authors for next year will be in order to read some of their books over the summer. A K2 student's persuasive letter. Our K2 students care about their environment. They have been discovering how to reduce waste as part of their service learning in their classrooms. After learning about the negative impact plastic can have on the environment, students decided to write letters to the librarians and principals. Student wanted to help make a change. Why not replace our plastic library book bags with longer-lasting, cloth bags? The librarians got to work designing a library bag. We wanted the bags to be easy to carry, to fit a range of different sized books and to last for a long time to prevent waste. We hope our students will use these bags for many years! At a K2 assembly, Ms. Strate, Mr. Advento, Ms. Bello, and Ms. Pollock shared how they had read the students' letters. They were very impressed with the students' compassion and desire to take action to make a change to help our environment. The new library bags were revealed! Each K2 student received a bag with a special name tag. Next year, all students in K1 and K2 will receive a library bag. And, our returning Grade 1 students will continue to use their bags. Any other student or family may purchase a bag for AED 30 from the Elementary Library. Thank you K2 students and teachers for your initiative in helping to make a positive change and to set an example for all of our elementary school. Your voice has made a difference! Don't miss your chance to purchase books and have them signed by our visiting authors! Book sales will begin on Sunday, February 26 in the Elementary Library. We have several titles available by each of our visitors, Victoria Jamieson, Matthew Holm and George O'Connor. Prices vary depending on format, so please stop by the make your selection. Students and parents are welcome to come by the Elementary Library throughout the day. Typically, the books usually sell out within a week. First come, first served! When you purchase a book, we will label it with the name for the dedication and the class section for delivery. All books will be signed by the authors during their visit and returned to students homeroom classes by March 23, before Spring Break. Please note, your are also welcome to bring in your own copies of books purchased outside the library to have labeled and signed. 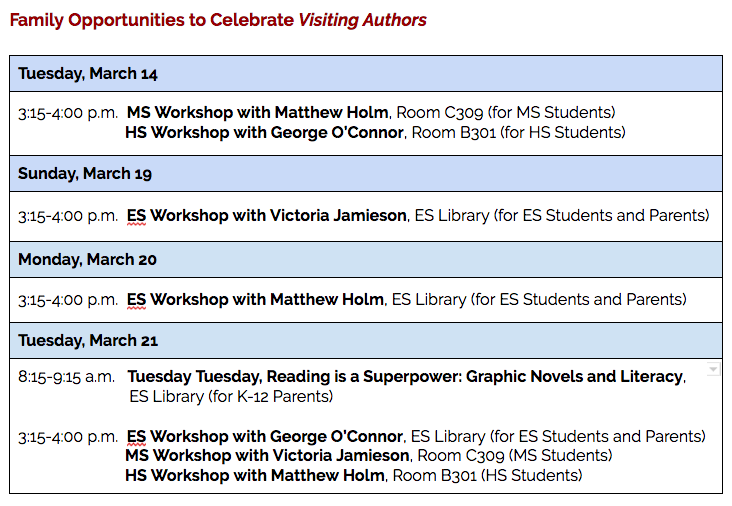 We will celebrate graphic novels in our reading community with Victoria Jamieson, Matthew Holm and George O'Connor joining us as authors and artists in residence from March 12 - 24, 2017. Our students are getting ready, reading as many graphic as they can get their hands on! We can't keep the books on the shelves! Each grade level in the Elementary School is exploring graphics in both library class and in their classrooms. We are examining elements of graphic novels such an panels, gutters, captions, dialogue balloons, motion lines and more! Learn more about our talented visitors below and by exploring their websites. Victoria Jamieson is a children's book and graphic novel author and illustrator. Her works include Roller Girl, winner of the 2016 Newbery Honor, The Great Pet Escape, Olympig and Bea Rocks the Flock. She studied illustration at the Rhode Island School of Design, and went on to receive her MA in Museum Studies at the University of Syndey. After living in Rome, Montreal, and Australia, she moved back to the United States, where she began working as a designer with a children's book publisher in New York City. She now lives in Portland, Oregon, with her husband and young son. Along with writing and illustrating, she teaches children's book illustration at Pacific Northwest College of Art. Matthew Holm is the co-creator of two critically-acclaimed and award-winning graphic novel series for children, Babymouse and Squish. Together with his sister, author Jennifer L. Holm, the pair created both graphic novel series, and raised the profile of the graphic novel in children’s literature, as well as proved how important graphic novels can be in getting children to learn to read. Babymouse and Squish have become staples on classroom and library shelves around the world, and have enticed even the most reluctant readers into reading for pleasure. Matt is also a professional graphic designer and the Consulting Creative Director for Hot Knife Design, Inc., of Boston, Mass. He lives in Portland, Oregon, with his wife and dog. George O’Connor’s first graphic novel, Journey Into Mohawk Country, used as its sole text the actual historical journal of the seventeenth-century Dutch trader Harmen Meyndertsz van den Bogaert, and told the true story of how New York almost wasn’t. He followed that up with Ball Peen Hammer, the first graphic novel written by playwright Adam Rapp, a dark dystopian view of a society’s collapse as intimately viewed by four lost souls. Now he has brought his attention to Olympians, an ongoing series retelling the classic Greek myths in comics form. In addition to his graphic novel career, Mr. O’Connor has published several children’s picture books, including the New York Times best-selling Kapow, Sally and the Some-Thing, and Uncle Bigfoot. He lives in Brooklyn, NY.